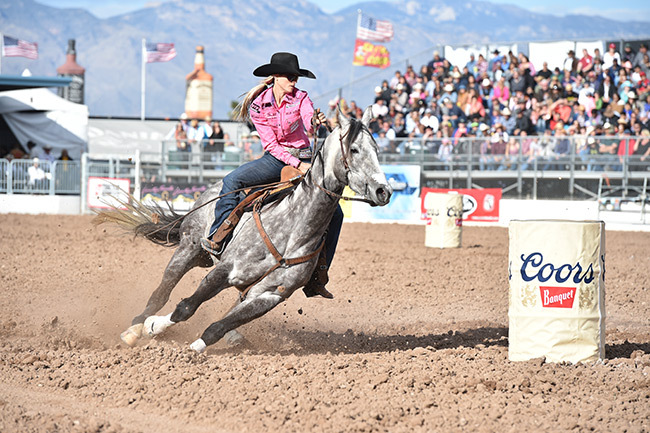 Tucson, Arizona — 2016 Wrangler NFR qualifier Stevi Hillman jockeyed her way to the winner’s circle at La Fiesta de los Vaqueros in Tucson, Ariz., over the weekend. Hillman aboard a new horse, MCM ImASharpGuy, finished with a two run time of 34.95 seconds to capture the win. Sharpie, as the 5-year old grey gelding is affectionately called, made a name for himself and his owners Matt and Bendi Dunn in the futurity ranks last year with Jolene Montgomery winning the average at the 2016 Greg Olson Memorial in Buckeye, Ariz. He also carried Troy Crumrine in November of 2016 to a qualification to the 2017 American Rodeo. Now, Hillman is taking the reins in the ProRodeo ranks and appears they will be a duo to keep an eye on. Hillman also captured the win at the San Patricio County PRCA Rodeo in Sinton, Texas, aboard Cuatro Fame, aka Truck, with a time of 17.30 seconds.